Nineteen Pakistani secondary school counselors recently completed a two-week professional development tour, organized by EducationUSA at the United States Educational Foundation in Pakistan (USEFP). 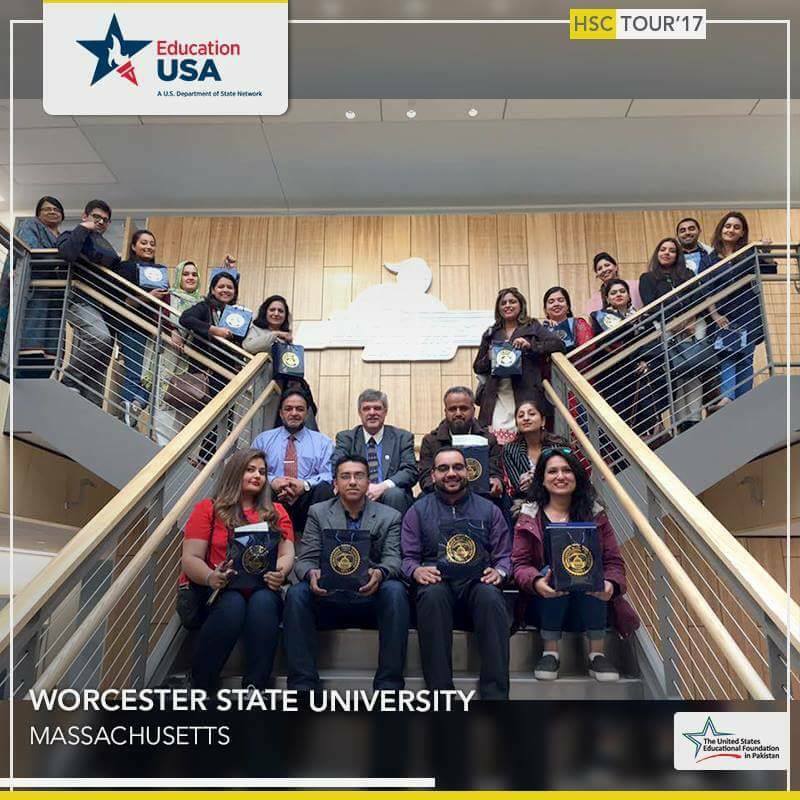 The participants, who hailed from across Pakistan, visited twenty-two leading American academic institutions in 4 states: New York, New Jersey, Massachusetts, and Connecticut. 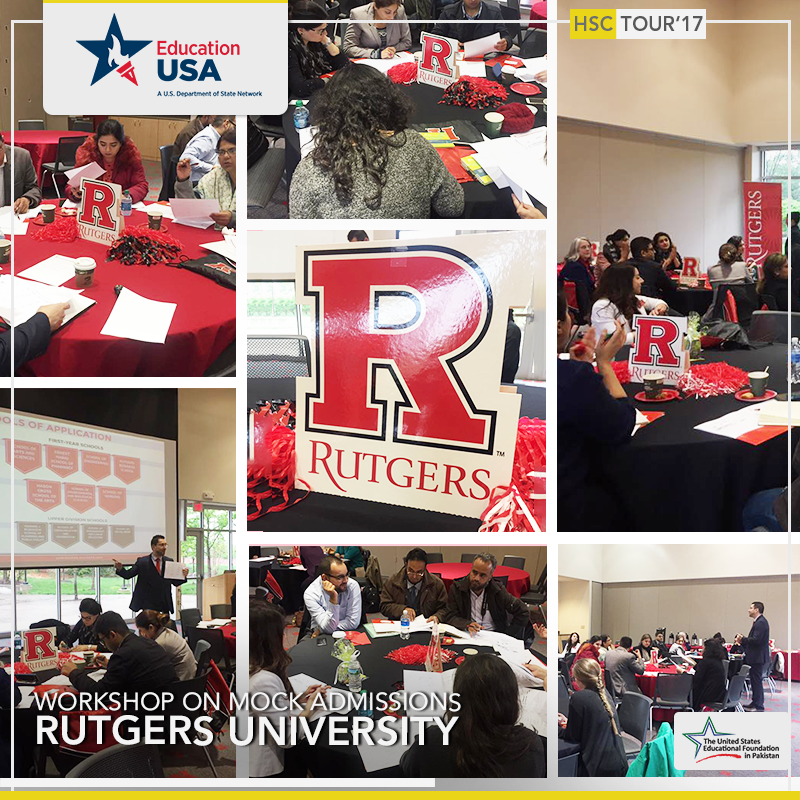 The tour provided Pakistani high school counselors with a unique opportunity to build on their current skills set and to learn more about the U.S. university admissions process directly from key officials at select universities and colleges. The speedy tour comprised of a series of university campus visits, training sessions by college admissions representatives, and targeted events for the school counselling community. Pakistani counselors also participated in panel discussions and workshops, and attended informal events to network with U.S. college counselors and administrative staff. “We provide Pakistani high school counselors with a topnotch professional training opportunity that allows them to not only build connections, and experience diversity, but to learn firsthand what the U.S. college admissions process entails,” said USEFP Executive Director, Rita Akhtar. The counselors in turn share this information directly with officials at their respective high schools, which greatly benefits the students, and simultaneously assuage the concerns of Pakistani parents about the U.S. admissions process,” she added. Participants also had the opportunity to learn about letters of recommendation, scholarship and financial aid options, and regulations governing work options while enrolled on campus. Overall, the participants had a whirlwind tour of 22 academic institutions in less than 12 days! U.S. colleges and universities visited as part of this year’s tour include: Stockton University, Rowan University, Rutgers University, Fairleigh Dickinson University, Monmouth University, Brookdale Community College, Stony Brook University, New York Film Academy, Columbia University, New York University, University of Bridgeport, Yale University, Mount Holyoke College, University of Massachusetts, Elms College, Western England University, Bay Path University, Worcester State University, Merrimack College, Suffolk University, Harvard University and Massachusetts Institute of Technology. 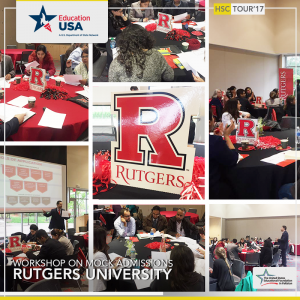 EdUSA Pakistan at USEFP has conducted this tour for the third consecutive year as part of its mission to provide accurate, current, and comprehensive information on U.S. colleges and universities. 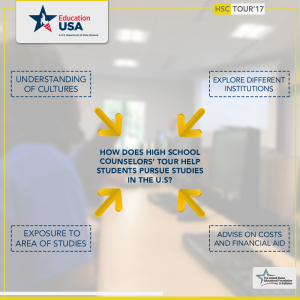 While this year’s high school tour took participants on a journey to the ‘East Coast,’ previous tours targeted academic institutions in the west (California and Arizona) in 2016, and Midwestern states (Indiana, Iowa, Illinois) in 2015. 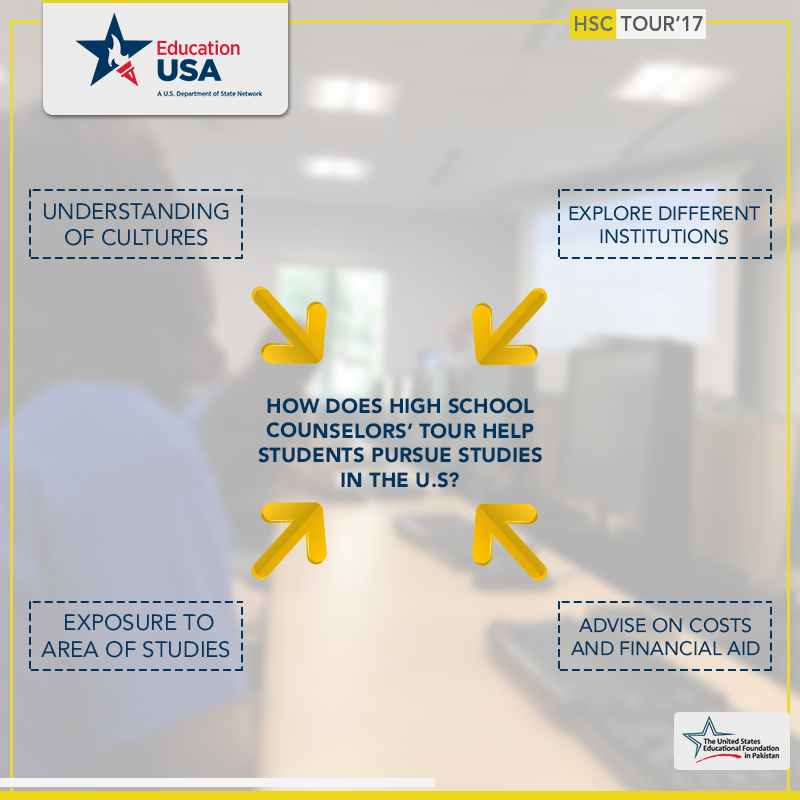 To view a video recap of this year’s High School Counselor’s Tour, click here. You can also learn more about each campus visit, by searching for #HSCTour2017 on Facebook.